Celebrate Easter with the Hoppiest Best Fiends Update Yet! Easter Eggs Aren’t the Only Things Hiding in Minutia! 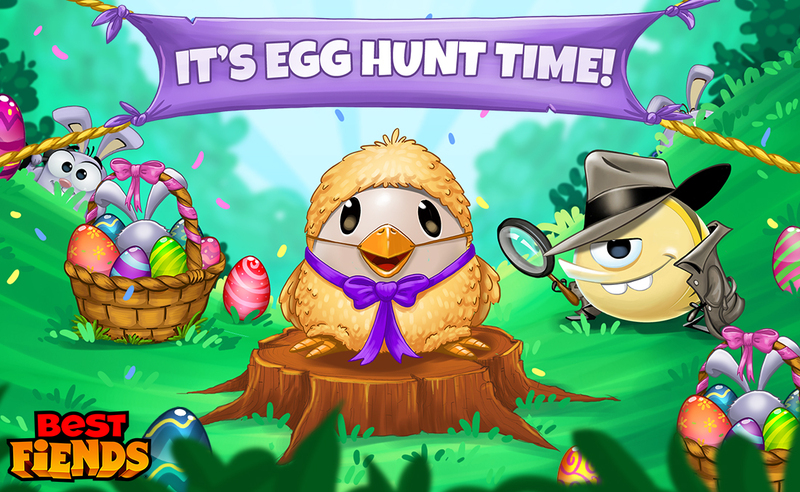 Search throughout Minutia for Rascal’s missing cousins so Hatchling Splendid’s Easter Party can begin! Find all the escaped bunnies hidden around the game to win Keys and GOLD! Don’t forget to to add super cute Hatchling Splendid to your Best Fiends team! Detective Kwincy is on the Case! Detective Kwincy is ready to take on his first case: the mystery of the half-eaten cake! Help him piece together clues and solve the mystery to win the super sleuth Detective Kwincy! Now that’s icing on the cake! Collect Marshmallows across 30 challenges in the Spring Treat Trail and earn Fiendtastic rewards! Complete all 30 challenges, and you’ll win the adorable Little Rascals! Continue the Trek through the Thermal Taiga! Forge ahead through the Thermal Taiga geysers with 20 NEW LEVELS every weekend for a total of 80 NEW LEVELS! Look out for the “fiery bird” that’s rumored to appear over the Celestial Springs! There’s something fun for everybunny in this latest update, so be sure to download or update Best Fiends for free HERE! And Happy Easter from all your favorite Fiends and Slugs!